Wild hyacinth (Camassia scilloides) of the Agavaceae (Century Plant) family, formerly of the Liliaceae (Lily) Family, is also known as Atlantic camas and eastern camas. It is found in the U.S. from Texas to Wisconsin and eastward to Georgia and Pennsylvania, with scattered occurrences in the Carolinas and Virginias. 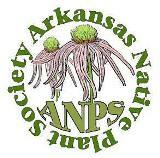 In Arkansas it is found primarily in the highlands of the northwestern two-thirds of the state, with additional occurrences in the Grand Prairie and the western Gulf Coastal Plain. Favorable sites for wild hyacinth have light shade to full sun, with moist, rich, loamy soil along stream terraces, in bottomland forests, glades and prairies. 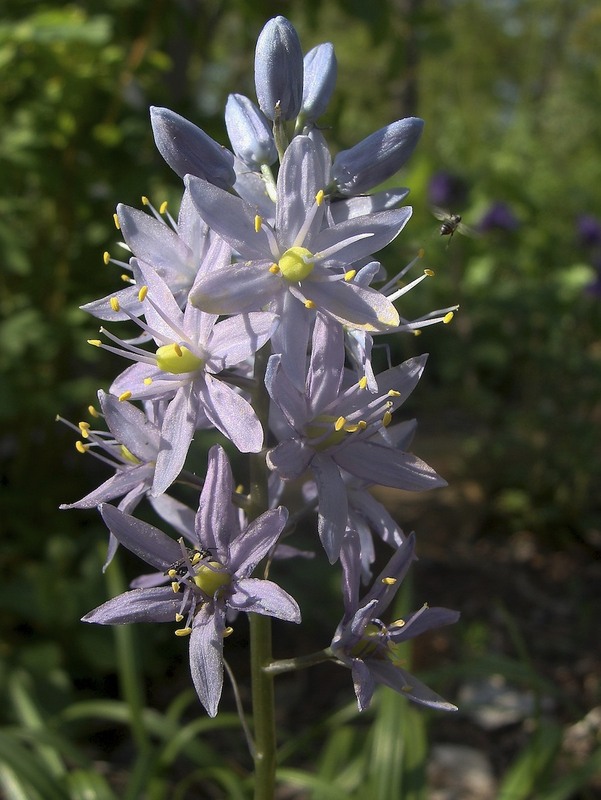 The genus name is a combination of Native American words “camas” and “quamash” for “sweet” in reference to its bulb which was an important food source for Native Americans. * The epithet “scilloides” is from Latin for “like Scilla” for a European plant with similar bulbs and leaves. Wild hyacinth has spikes of flowers somewhat similar to the introduced garden hyacinth (Hyacinthus orientalis). 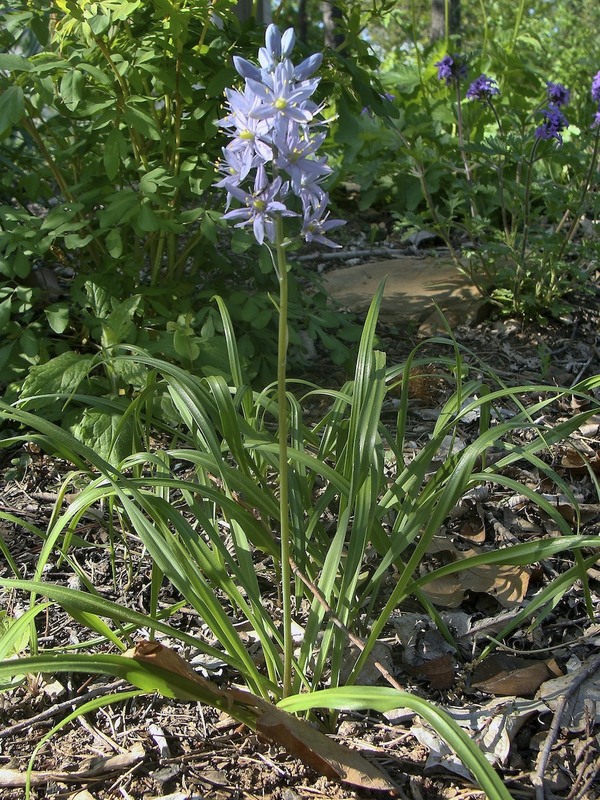 Wild hyacinth, a long-lived perennial, consists of a rosette of long, arching to reclined leaves and a flower stalk 1½-2 feet tall growing from a bulb with fibrous roots. All parts of this ephemeral plant are glabrous (hairless). Leaves, less than one inch wide and 6-12 inches long, are medium to dark green with smooth margins. They have raised midribs on the undersides and are folded lengthwise in the lower halves. They are generally somewhat floppy and twisted. An erect, slender, light to medium-green, 1-2 foot tall stalk terminates in a raceme of flowers along the upper third. The stalk is leafless except for several sterile bracts that may occur just below the raceme. Each flower initially grows from the axil of a bract, with most of the bracts in the inflorescence falling off as the flowers open. The bracts, linear and up to ¾ inch long, are the same color as the stem. 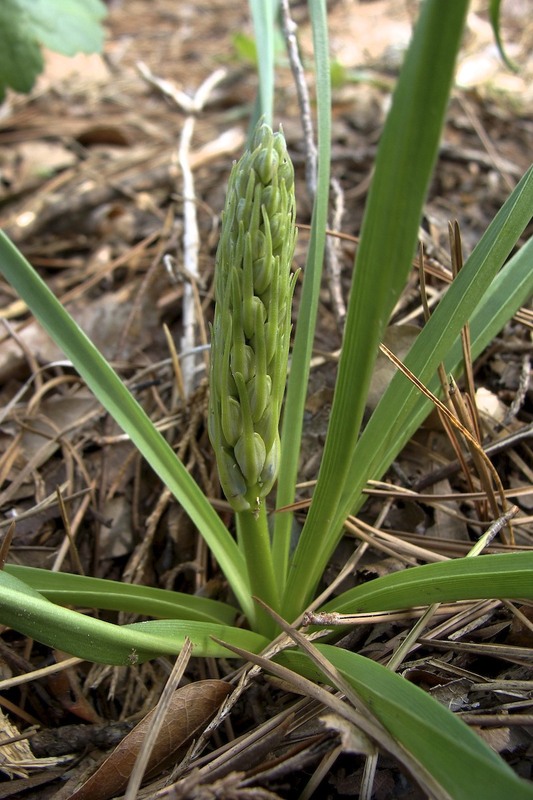 Photo 1: Wild hyacinth inflorescence stalk emerging in spring from rosette of leaves. The lower portion of leaves are often folded and twisted. The flowers occur in axils of linear bracts which are later deciduous. Photo 2: In wild hyacinth, most of the bracts in the inflorescence have fallen by the time the flowers open. In this photo, only a few bracts below the raceme remain. Flowering, in late spring, lasts about two weeks, with individual flowers lasting two to three days and opening successively from bottom to the top. Flowers, 3/4 to 1 inch across, each consist of three sepals, three petals, six stamens with bright yellow anthers, and a light yellow, ovoid ovary topped by a long, slender style. The light blue-violet to nearly white oblong tepals (sepals and petals) are widely flared. Slender anthers and styles are about the same diameter and length. Flowers, pollinated by bees, have a pleasant scent. Photo 3: Wild hyacinth has relatively large ovaries with long slender styles. Note two possible pollinator insects can be seen in this photo. 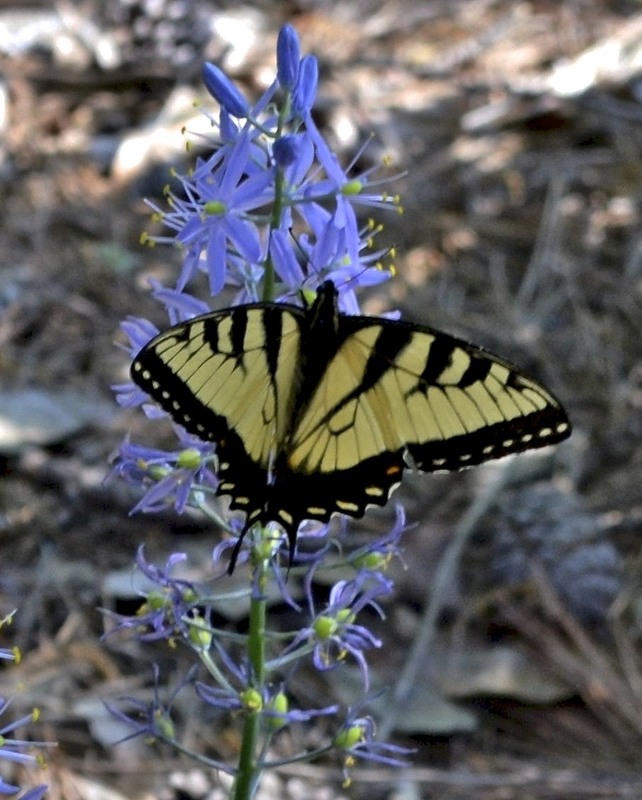 Photo 4: Tiger Swallowtail nectaring on wild hyacinth. Note the lower flowers fading while upper flowers are still in bud or just opening. Fertilized flowers are replaced by a three-loculed (chambered) capsule 1/3 inch long and wide. Locules appear somewhat inflated, with dark green lines demarking the locule junctions. Relatively large, shiny black seeds are limited to a dozen or so per capsule. Wild hyacinth reproduces readily by seed. 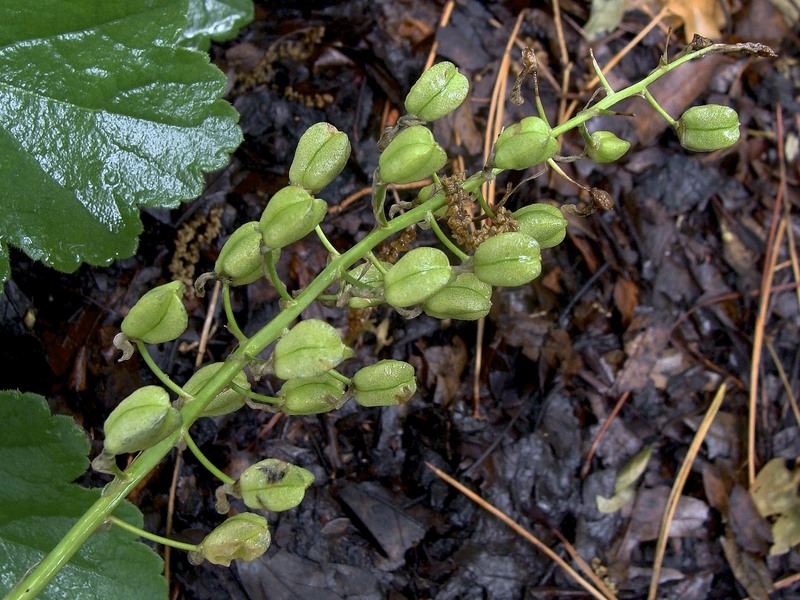 Photo 5: Seed capsules of wild hyacinth become brown as they mature and as the plant begins to goes dormant. Wild hyacinth is a great ephemeral to have in a garden, especially in its own space where its character can be fully appreciated. Its appearance in late winter to early spring is a welcome sight. The flowers attract bees, flies, butterflies and wasps. Footnote: Prairie wild hyacinth (Camassia angusta), also called prairie camas, is known to occur in Arkansas in Benton, Washington, Sebastian and Logan Counties. Prairie wild hyacinth can be differentiated from wild hyacinth in that its flowers bloom several weeks later and are slightly smaller, the bracts below the inflorescence are more numerous and persistent, and the capsules are longer than wide. *Bulbs of wild hyacinth were a highly nutritional food for Native Americans and early explorers. Bulbs were used raw, baked, roasted, boiled or dried. Remains of wild hyacinth (and other plant species) have been identified in earth ovens (middens) used by Native Americans. For a detailed article relating to middens and plant remains studied at Camp Bowie, Texas, see: www.texasbeyondhistory.net/bowie/middentell.html. CAUTION: wild hyacinth bulbs and leaves look similar to those of the white-flowered death camas (Toxicoscordion nuttallii), a highly poisonous native plant. This entry was posted in Know Your Natives, Native Plants, Wildflowers and tagged Agavaceae, Asparagaceae, Camassia, Camassia scilloides, Wild Hyacinth. Bookmark the permalink.